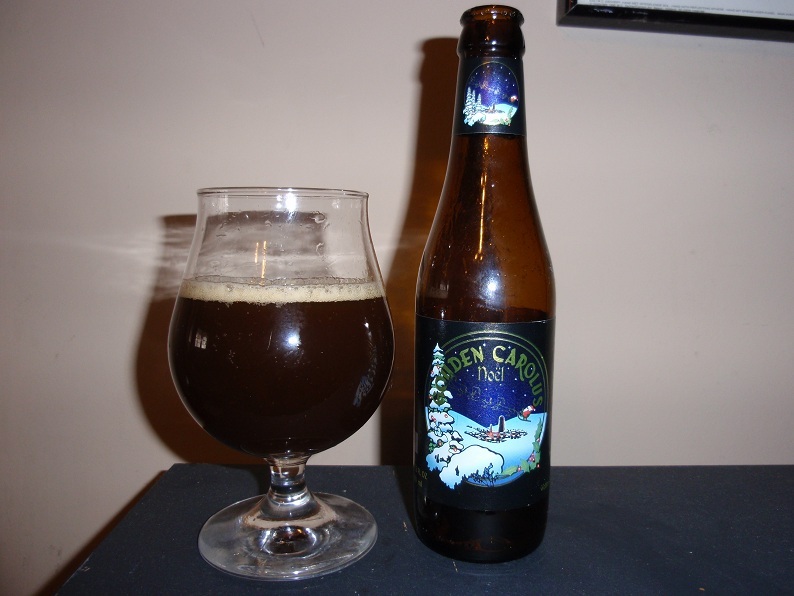 Today I have what is sure to be an interesting Christmas inspired ale from the brewery Anker out of Mechelen, Belgium which crafts Gouden Carolus brand ales. I have enjoyed a number of their ales, particularly their Belgian IPA style Ale Hopsinjoor and can’t wait to see what this 10% holiday ale has in store for me. Coming highly recommended by Alvey of The Four Firkins I can’t wait to dive in, so lets get to the good part. This attractive holiday inspired 11.2 oz bottle is labeled L 0743 03/08/10. Pours with one finger of rather tight tan head that completely dissipates with in two or three minutes. Color is a dark brown hue that reminds me a bit of a slightly watered down dark coffee allowing no light to pass through. Strong aromas of alcohol, rich caramel and toffee are most notable with Belgian Candi sugar most assuredly used in this recipe. Gentle dark pitted fruit esters help round out the nose. Flavor is quite nice with the caramel and toffee sweetness expected from the aroma as well as a delicious gentle roasted malt character and decent dose of alcohol that nicely contrasts with the serious sweetness present in this ale. Gentle herbal esters and a variety of dark pitted fruit notes add additional character to this ale creating one tasty brew. 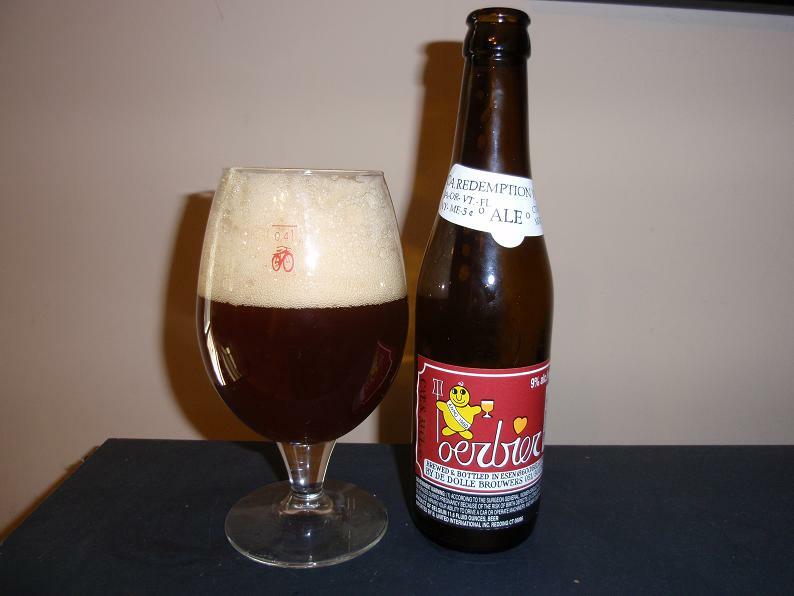 Body is medium for a Belgian Strong Ale and mouthfeel is quite smooth and almost a bit creamy. While not an ale for those afraid of ABV clocking in at 10% I feel the somewhat strong alcohol esters add a wonderful component that helps make the lack of bitterness less relevant. Definitely not your typical holiday ale with more Beligian Yeast, dark pitted fruit and Candi Sugar notes than the typical herbal onslaught of many in the style. If you enjoy complex Belgian Ales with a myriad of toffee and caramel flavors than this is the holiday beer for you, or just a solid ale to drink anytime you want something hearty. Unquestionably one of the best holiday inspired ales I have had an opportunity to consume. Give it a shot and ride your bike. Today I have a very interesting beer I found on the shelves of The Four Firkins a few weeks ago. I knew nothing of this beer upon picking it up other than it was from Esen, Belgium and that it was a 9% ABV beer brewed with some funk. From reading their website the De Dolle Brouwers (The Crazy Brewers) appear to be a pair of creative and humble brothers who took the opportunity to take over their brewery from the previous owners when they decided to shut the doors in 1980 and have continued to brew some interesting craft beers including their Oerbier, or Original I have here before me. This beer is bottle conditioned and said to age well but lets get to drinking. Though It was obvious this would be a carbonated beer as soon as I opened the bottle. Pouring it creates a massive four finger bouquet of off white head with loose bubbles that dissipate relatively quickly creating quite a show. Color is a dark and hazy brown hue similar to a date and is completely opaque. Initially I get some gentle tartness and carbonation in the aroma as well as some grain. I am consuming this beer at just below room temperature as it has been sitting out for about 50 minutes and the flavors are quite interestingly subtle. A nice malt backbone with dark pited fruit hints is present providing some sweetness to contrast the interesting but not overpowering tartness and a bit of additional funk that would seem to come from the yeast used in this brew, though their website clarifies that “Since 2000 as the yeast supply ceased, we installed a new yeast propagator. The tart aftertaste is obtained by lactobacterial fermentation (since 2005).” so obviously that isn’t quite the case as lactic acid is used. The mouthfeel of this beer is very carbonated but clean. Body is on the light end of medium. Overall this is an interesting sour beer. Certainly the strongest I have ever consumed at 9% ABV as well as one of the most carbonated. Flavors are reasonably balanced between tart and fermented pitted fruits which certainly makes for an interesting beer. Not a mind blowing beer but a good example of some of the funkiness you can create with beer and something that wouldn’t be a bad choice to sample even in its small 33cl bottle. Give it a shot and ride your bike. Today we have another ale from Brewery Ommegang, the fine New York based, Belgian owned and inspired brewing company. To celebrate their 10th anniversary in 2007 they decided to brew a chocolate ale and because of its success they have continued to brew it for the lucky folk of the world such as myself. I have yet to be disappointed by an ale they have produced and even with a simple 7% ABV I cant wait to give this brew a try. Pours a lovely dark black color that is not translucent at all with a solid 3 fingers plus of beautiful frothy cocoa colored head that takes many minutes to dissipate. Giving this ale a little swirl stirs up more carbonation giving this ale a nice crown of brown to add to the lacing that is already around the glass from the initial pour. All of Ommegang’s ales tend to be plenty carbonated but this one has marvelous head retention. This brew initially smells mostly of coffee and then some other nice dark malts that eventually create a malty chocolate aroma with a nice roasted hint. Well this is certainly a stout, tastes of dark lightly roasted malts creating many coffee like flavors. For a stout the body is reasonably light and the mouthfeel is smooth and only a little carbonated. There is definitely some noticeable sweetness produced by all the malt in this ale but it doesn’t particularly strike me as chocolate flavored. Definitely a flavorful stout that incorporates both sweet and roasted flavors nicely and shouldn’t be too intimidating, particularly because of how well the ABV is covered up. If you like milk stouts but want some more roasted flavor this would be a wonderful brew for you. Not as much chocolate flavor as I was hoping for but still pretty good overall . Give it a shot and ride your bike. Today The Session is brought to us by Beer and Firkins, posing the question: What will I miss from 2008 and what will I excitedly await in 2009? Though this is a quite broad question that I’m sure everyone will respond to differently I know what I will miss the most from 2008 is growlers from Surly Brewing in good ole’ Minnesota. Though I love my state and its breweries we have the unfortunate problem of being stuck in a state that seems to have forgotten that “blue laws” are a thing of the past, that is for those who don’t know laws that were traditionally created to appease the church and the thought that beer should not be consumed on Sunday because you should be in church! Though these laws aren’t restricted to Sundays it is a common term used to describe limitations in liquor laws. Though I have nothing against spirituality I’m sure you can realize how many of these laws are outdated and simply not helpful. Though it is unfortunate that we can not buy beer on Sundays in our fine state I can handle it, what I can’t is the other hoops and complications the force breweries to deal with, limiting their business potential, costing them more of their hard labor and money and more humorously reducing the amount of tax revenue our state is able to generate. Though all of the laws limiting what breweries/brewpubs can and can not do bother me, such as the fact that you can legally only operate one of the two and not both the current law I am here to complain about and fight against is breweries (and brewpubs for that matter) ability to off sell their products. We all (should) know that our liquor distribution systems are unnecessarily complex, but that as well is a rant for another time…so to get to the nitty gritty. In many states breweries and brewpubs alike are allowed to off sell to customers bottles of any size to patrons that wish to purchase their product and are of legal age. Sure they need a license but there’s just more incentive for the state. Our fine Surly Brewing how ever has dealt with many hurdles in their journey to off sell growlers to the community. After going through all of the work of getting the city of Brooklyn Center to approve the sale of growlers and having great success for just over the past 2 years the joyous Saturday mornings of cycling up to their brewery and carting home their beer are over. Minnesota State law 340A.301 allows for licenses to be granted to brewers who produce less than 3500 barrels a year. As it should be everyone loves Surly Brewing and has made them a great success continually forcing them to brew more beer and causing them this year to surpass the limit for licensing. To me this is a very silly and completely useless law, and according to Omar on the last Saturday of this year while waiting in line for their wonderful 16 Grit Imperial IPA will loose the state $20,000 in tax revenue (I assume he meant annually).Â Luckily the Minnesota Craft Brewers Guild currently has a petition to help change these things and I will do everything I can to support them in their venture. On to the happier things. What I look forward to in 2009 aside from simply more beer is the trend of collaborative ales that has sprouted in 2008 and where others may take it. I am a fan of all things communal and beer is always better when shared so I say the more the merrier. There was Flying Dog’s Open Source Beer Project that created a Dopplebock, there will soon be a joint effort by Dogfish Head and Beer Advocate which is sure to be interesting though I doubt I will have the opportunity to make it down to Boston to sample it, and what we are here to try today the effort by Avery Brewing and Russian River Brewing: Collaboration Not Litigation Ale. Though there are a few more I neglected to mention this ale in particular has a wonderful story. Brewers at both breweries happened to meat a number of years ago and learned they both were brewing ales called Salvation. 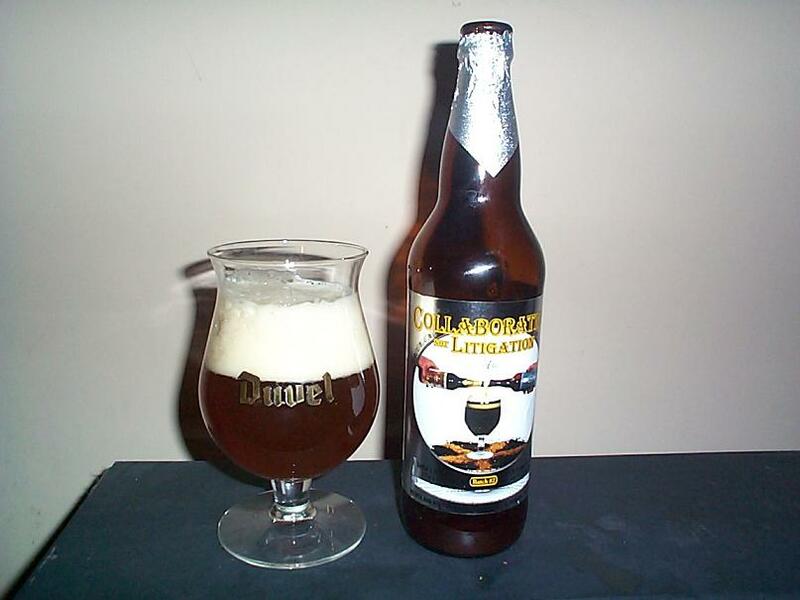 With all the silly legal battles people are fitting in this day and age the two friends considered what to do and came up with the perfect solution, make a whole new beer additionally that comprised of both ales. So at the bar of Russian River the two sat down and found the perfect mix of the two very different but uniquely Belgian inspired ales, Avery’s being a Golden Ale and Russian Rivers being a Strong Dark Ale both packing a solid 9% ABV. The first batch was bottled in December of 2006 and the second batch which sits on my table was bottled February 2008 and uses a slightly different mix. The proceeds of these ales will go towards sending brewers from not only Avery and Russian River but Port Brewing, Dogfish Head, and Allagash Brewing on a trip to Belgium to see how they have been doing it for centuries in attempt to improve their own craft skills, talk about a good cause. Now on to the better stuff. This beer pours a dark pumpkin color that is a bit hazy though no sediment is apparent, allowing a bit of light to shine through the bottom of the glass in orange and red hues even if it is not particularly translucent. Head is a solid three fingers or more and crisp white in color lasting for a couple minutes. Aroma is quite nice, gentle fruit aromas are dominate with some slightly floral hints as well giving a bit of a kick to the otherwise sweet malty scent. They must have had a blast sampling different mixes of this ale as the flavors are very unique. Prunes, and other sweet pitted fruits are noticeable as well as more somewhat hoppy citrus flavors. 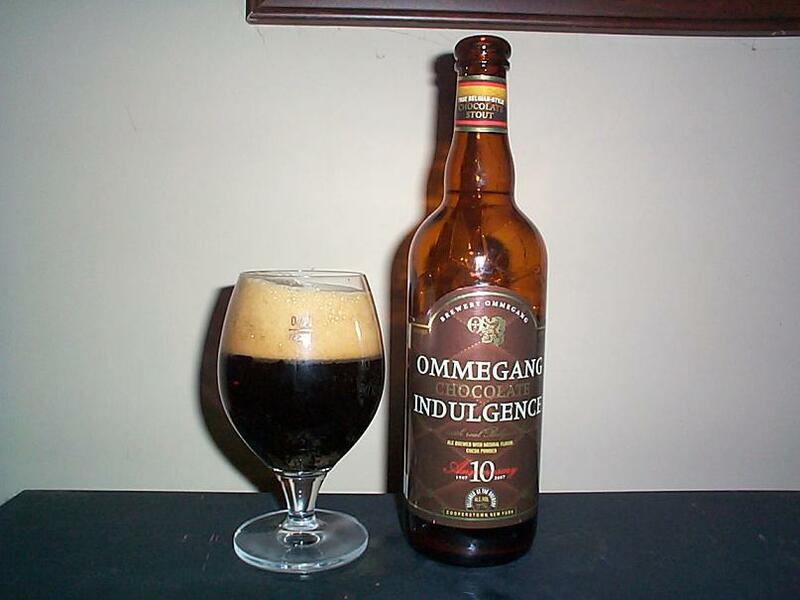 This ale is packed with malty sweetness and is obviously influenced by Belgian brewing with an interesting yeast no doubt contributing some flavor as well as other nice caramel flavors from the malt.. This ale has a rather light body and a slightly sticky but incredibly smooth mouthfeel. Though there are many flavors in this beer the sweet malt flavors do a impeccable job hiding the 8.72% ABV. I had no idea what to expect the mixing of a golden ale and a dark ale would create but this is certainly a tasty brew and a nice American take on a Belgian concept as well as a wonderful approach to an interesting situation. Probably not an everyday beer but a great after meal desert ale. If you are a fan of Belgian inspired ales that are sweet and malty but are still not afraid to pack a punch this is a good choice. To note, the last third of this ale had a hazier and darker color no doubt from sediment at the bottom of the bottle. Very smooth and delicious stuff. Give it a shot and ride your bike. Here we have another interesting beer from the fine folk at Dogfish Head in Milton, Delaware. Raison D’Etre is brewed with Belgian beet sugars and green raisins and is sure to be a unique experience. As the bottle says, this beer pours a deep mahogany color that is very opaque, with red tones shining through as you bring it to the light. Producing about 1/2 inch of very light tan head that settles very quickly. The aroma is intriguing, prune and raisin scents are nicely rounded off with gentle roasted malts and a slight smell of alcohol. The flavor of this beer is very different. Tastes of raisins or plums and a very strange sweet flavor surely influence by the beet sugar used in this brew, a bit of malt seems to round off the flavor but it is rather difficult to place the flavors in this ale. Though this beer is 8% ABV the alcohol is rather mute, particularly when distracted with all of the very interesting flavors in this beer. As with many complex ales, more flavors are noticeable when served cool, but I find this beer more drinkable cold. The mouthfeel of this beer is a bit sticky but it is reasonably drinkable and the body isn’t too heavy. Though the flavors of this beer are very unique it goes down quite smoothly but likely will not be drunk very quickly. Certainly not the beer for everyone but if you are looking for something different and don’t oppose fruit flavors you may enjoy this brew. Give it a shot and ride your bike. 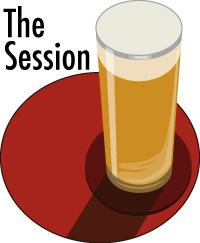 This month The Session is being hosted by Bathtub Brewery and Melissa and Ray have come up with a rather interesting topic: Beers and Memories. I knew a day would come when I felt it was the perfect opportunity to talk about a beer that I admire dearly yet have avoided blogging about. 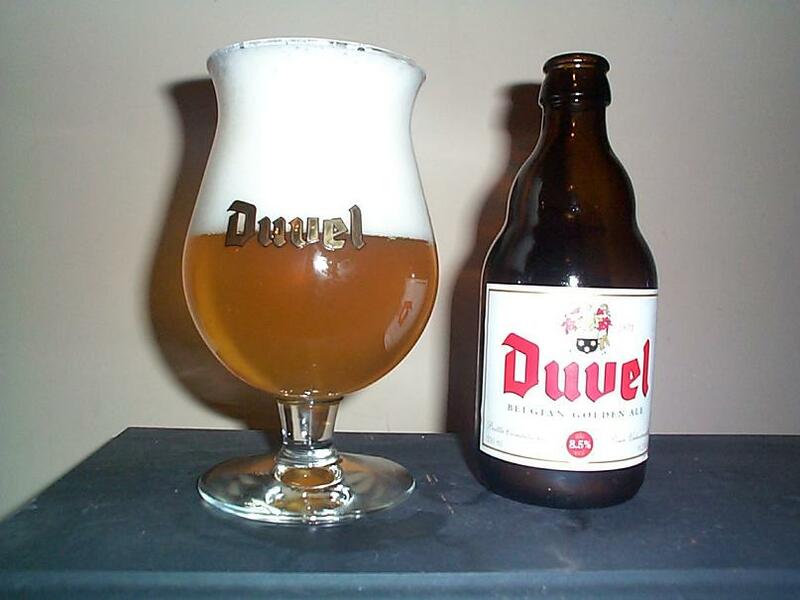 Duvel is a Belgian Strong Ale and is likely the staple for this style. Brewed by Duvel Moortgot in Puurs, Belgium since over a century ago this beer has far too much history to summarize. I chose this beer for The Session this month because though I’ve never been to Belgium (unfortunately) this beer always reminds me of my second trip to Europe. Though perhaps it would seem more appropriate to make this post about Heineken or any number of other mass produced and popular beers of Europe it is not so. While riding trains from The Netherlands to France and particularly the Chunnel from France to the United Kingdom I experienced the convenience of having alcoholic beverages available on a long trip. Though the food was decent the beer was spectacular. When riding through the Chunnel there are a number of hours where you can’t even look out the windows because all you see is the black of the tunnel walls, not to mention the fact that you are under water. This didn’t particularly frighten me, but it was very strange so I decided the most logical thing to do was to have a few beers and have a rest. Reconizing the name and bottle from the very few occasions I had tried it prior Duvel seemed like the logical choice for a drink, the 8.5% ABV also helped me make up my mind as it was only a Dollar or I suppose more accurately a Euro and change more expensive than a boring and light Heineken. Not only was it lovely to have a deliciously flavorful Belgian Ale to enjoy during the ride but after two beers it made it very easy to rest my eyes. Ever since that day I have become a sucker for Duvel and for a long while drank it quite regularly. Sadly it has been quite some time since I have purchased this ale, so tonight will be well deserved particularly as the price of this beer seems to continue to rise, oh well it will always be worth it to me. Though Surly Furious was the beer that got me into American Ales my second trip to Europe and Duvel were what got me to really appreciate beer and its flavors, particularly Belgians so it will always have a special place in my heart. This wonderful beer pours a nice golden color that doesn’t have any sediment but seems slightly hazy depending on the light. Head is pure white and will overwhelm you if you do not pour carefully. Head is tight, thick and sticky and will not dissipate quickly likely leaving residue on the side of your glass that will eventually harden quite intensely. This beer simply smells like what I think of when I hear the term Belgian Golden Ale, sweet, malty and alcoholic with hints of nice spices rounding it off wonderfully. People claim to find many flavors in this beer, and I don’t doubt them. Though I mostly notice smooth caramelized malt sweetness, hints of bananna and other spices come out regularly. Though this beer is smooth there is no doubt you will notice it’s slightly bitter alcohol content, but at 8.5% ABV what do you expect. With a medium body and surprisingly light mouthfeel I find this beer very drinkable even though it is carbonated a bit heavily. If you like Belgian Ales particularly blondes but don’t mind the increased alcohol content you will certainly enjoy this beer. Perfect with fish or chicken this beer will compliment a meal very nicely, not to meantion help balance the alcohol out. Give it a shot and ride your bike.